Jiu-jitsu.News: Mr. Untouchable: Is Lucas Lepri The Best Lightweight Ever? Mr. Untouchable: Is Lucas Lepri The Best Lightweight Ever? Lucas Lepri became the winningest lightweight in Brazilian jiu-jitsu history by capturing his fourth division title at the IBJJF World Championships. For the past two years, Lucas' skill set propelled him to a completely new level of dominance. His 2016 bid for gold at the 2016 IBJJF World Championships ended in spectacular fashion: He didn't concede a single offensive point. 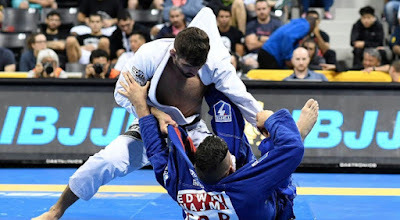 At the 2017 IBJJF Pan Jiu-Jitsu Championships, the 168lb Lepri decided to try his hand in the absolute division, a category normally dominated by super heavyweights. After two commanding matches, Lepri met the the 220lb Joao Gabriel Rocha and lost a closely contested match with the big man. Although the Alliance black belt ultimately walked away without a medal in the open class, his willingness to test his jiu-jitsu against any and all opponents is a testament to his philosophy and outlook on the sport. There have been many dominant champions over the years - Michael Langhi, Celso Vinicius and Márcio Feitosa all come to mind - but 2017 marked the year Lepri not only joined the winner's circle but also stood atop it.